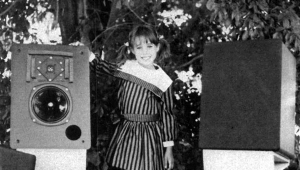 My self-imposed goals, which remain the same, are ambitious: I not only want to find a system or systems that a music lover can derive musical pleasure from, I also want to find a system that I can heartily recommend on the basis of "buy it once and buy it right"in other words, a system that can fulfill the promise of long-term enrapturement. As this and the next column will reveal, I think I've been more successful at meeting my first goal. It's possible that I may have set myself the task of designing a square circle: spend half the money or less than on the last system I put together, yet have it still be a buy-it-once-and-buy-it-right system that lets you get off the audio merry-go-round. Although this time the laws of physics, psychoacoustics, economics, and perhaps even human nature just might be against me, there are still lots of very worthwhile products out there. 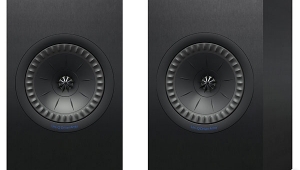 The Carat I57 CD receiver costs $1995, which leaves us with not a huge amount left in the budget for loudspeakerssomewhere between $1000 and $1500, taking into account the need for speaker stands and cables. PSB's new Imagine B two-way bookshelf model ($1000/pair) now joins Eminent Technology's LFT-16 and Renaissance Audio's MLP-403.5 speakers as worthy of your consideration if you're putting together a system in the $2500$3750 range. I originally didn't intend to cover the Imagine B, as its 5.25" mid-woofer seemed to go in the direction opposite from where I wanted to go. Two things reversed that decision. 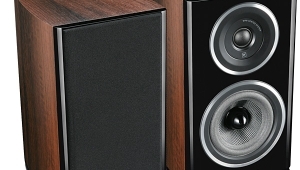 First, there just aren't that many speakers in the $1500-and-under range with larger woofers. Second, Stereophile's Stephen Mejias heard the Imagine B at its press intro in New York City, and told me he was very impressed. Now I am, too. The first thing I noticed about the Imagine B was that its appearance and its level of fit'n'finish are leagues ahead of its price. 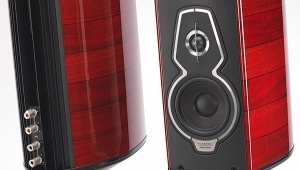 Veneer of real cherrywood stained a deep red covers the speaker's curving sides, top, bottom, and rear. The front panel is semigloss black. Grilles are provided, but I didn't use them. The woofer and tweeter are attached without visible fasteners, and both are surrounded by smooth, compliant, rubbery plastic. The rear port and biwire terminals are elegantly designed, as is the inconspicuous brace that stabilizes the rear, in view of the rounding of the cabinet's bottom. 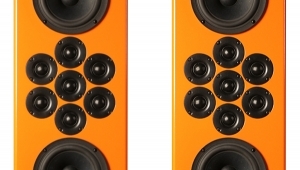 PSB claims that the Imagine B's frequency response is 52Hz23kHz, Ò3dB, its sensitivity 89dB, and its impedance 4 ohms. 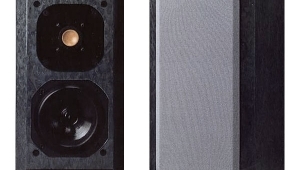 The crossover is said to be a fourth-order Linkwitz-Riley at 1.8kHz, and the speaker's internal volume is 7.7 liters. It measures 13" H by 7.5" W by 12" D and weighs 17 lbs. I used the pair of them on 24" stands, connected with Cardas Neutral Reference cables. 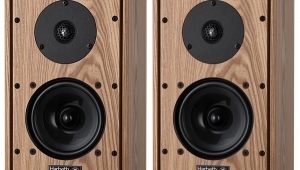 When I directly and unfairly compared the Imagine B to the twice-as-expensive Harbeth HL-3P-ES2 while playing Donald Fagen's The Nightfly (CD, Warner Bros. 23696-2), the PSB was more efficient (duh: ported vs sealed box), noticeably plumper in the bass, and a touch veiled (as distinct from rolled-off) in the treble. The pleasant surprise was that the PSB was at least in the same ballpark as the legendary Harbeth in terms of essential tone. When I then comparing the speakers using Julie London's Time for Love, the PSB was a little undefined in the bass and unrefined and peaky in the treble, but again, still very creditable. 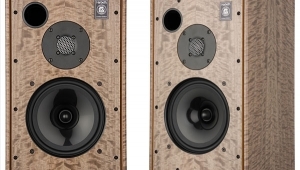 I then made an even less fair comparison, this time to Sam Tellig's new personal "last loudspeaker," Harbeth's superb Compact 7 ($3495/pair). This revealed the PSB's midrange to be ever so slightly dry, leaving the impression of something of a "smile" equalization (so called because that's what a mixing board's sliders look like when such an EQ has been set). With Charles Owen's disc of nocturnes, Fauré's delicate pastel tone colors sounded slightly too bright and saturated, and as if with a touch of added "edge definition." But the Imagine B should hold its little round head up proudly, because this comparison was to a speaker that is both substantially more expensive and an acknowledged champ at portraying tone colors. 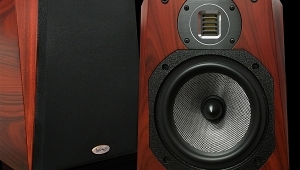 Had the comparisons been instead to other speakers in its price tier, the Imagine B would have come off much better. In the event, the fact that the Carat I57 has tone controls allowed me to dial back the treble one increment, which served to make the triangle, chime, finger cymbal, or whatever it is that was sticking out in Jane Monheit's cover of "Besame Mucho," from The Frank and Joe Show's 331/3 (CD, Hyena TMF 9320), a part of the musical mix instead of a distraction or an annoyance (footnote 1). 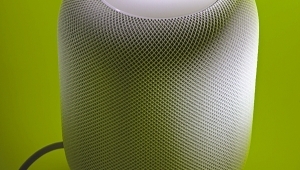 PSB's Imagine B is an important loudspeaker. I am very impressed with it, and I will return to it next time as I tie up some loose ends and try to make overall sense of this quest. 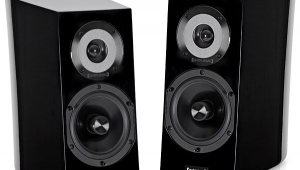 For the moment, I can say with confidence that the combination of Carat I57 and PSB Imagine Bs is superb value for money, and is a system that plays music surprisingly well while seeming to offer very little long-term risk of listener fatigue. Whether it can also be one's last system is an issue I will take up next time. Footnote 1: I accept the possibility that the Imagine B's metal-dome tweeter had not had adequate break-in, but that doesn't negate the overall usefulness of tone controls. 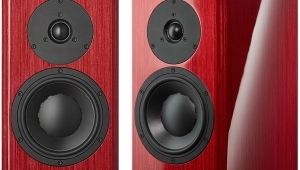 Stereophile has reviewed both of these. I was wondering how you folks feel about these two compared to each other ? From all my readings, and experience, this is the problem with all small speakers. 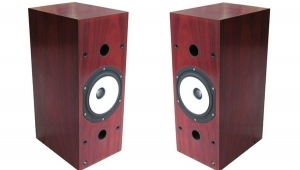 Ok, maybe there are a few small speakers that have good bass (PSB twenty22? ), but they are so expensive you might as well buy a tower. So, wouldn't a sub (or two) resolve this problem, and also add some other benefits (like offloading the imagine B's so their sound would be even better, etc..)? 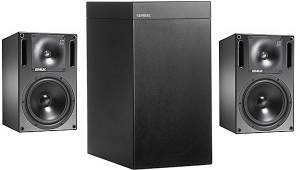 The question I've been pondering this weekend is this: given a set price to spend on speakers (say $2000), is it best to buy two towers/floorstanders ($1000/each), or, two bookshelf speakers ($750 each) and a $500 sub? 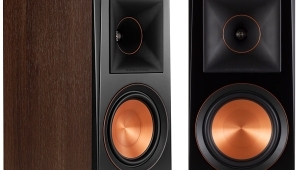 Both speaker systems are roughly the same cost - $2000.